So how is it that we’re summiting Rufus two days in a row, and in such amazing conditions? In part the answer is bushfires; and in part it’s drought, El Nino, and even climate change. All of those elements have combined to bring us twice to Mt Rufus. 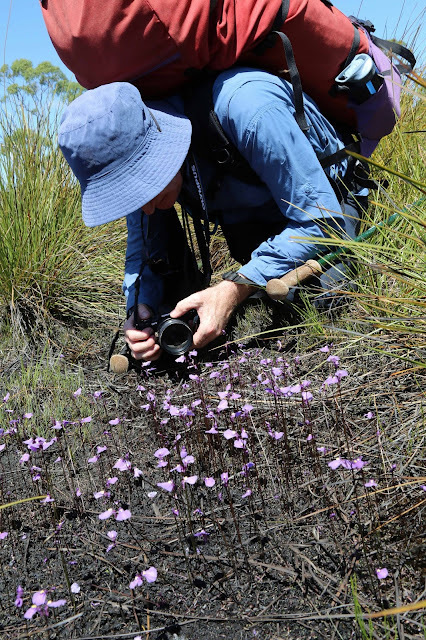 I’ve already characterised this summer’s bushfires as catastrophic, at least for our rare highland species (see here) In that context it’s just a minor inconvenience that our group finds itself at Mt Rufus because fires have closed the track to our intended destination. 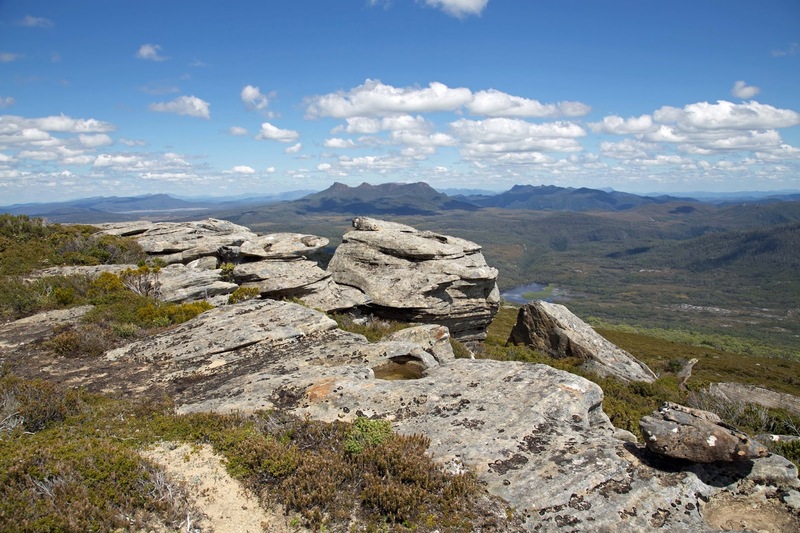 As the days of our planned walk in the Central Plateau drew nearer, the weather remained hot, and Tasmania remained ablaze. Even our Plan B – a walk in the south-west – was scuttled by closed tracks. It shows the riches of bushwalking in Tasmania when a place as beautiful as the 1416m Mt Rufus can be part of Plan C. Still, why summit twice? Heat comes into it again. Hot February weather isn’t conducive to steep and steamy adventuring, at least not for me. 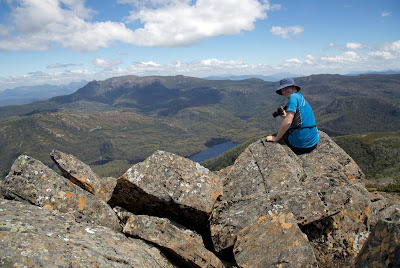 Instead we’ve chosen to base ourselves on the side of Mt Rufus, at the Joe Slatter Hut (more on that here), and do some tamer explorations of the nearby wilderness. Yet it isn’t just about heat. The fires ravaging parts of our wilderness have taken my soul to a dark place. Good company and good conversation will help that, but so too will being slow and quiet in the presence of grand vistas and tall trees. 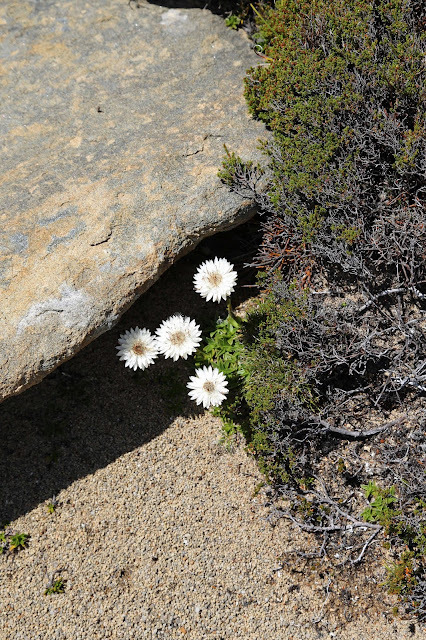 But with wilderness it’s not just about size. I’m also here to seek out some of the smaller wonders, from delicate wildflowers to intricately eroded rock formations. And I especially want to see pencil pines, to pay my respects, to hear their tidings after this most dreadful of summers. 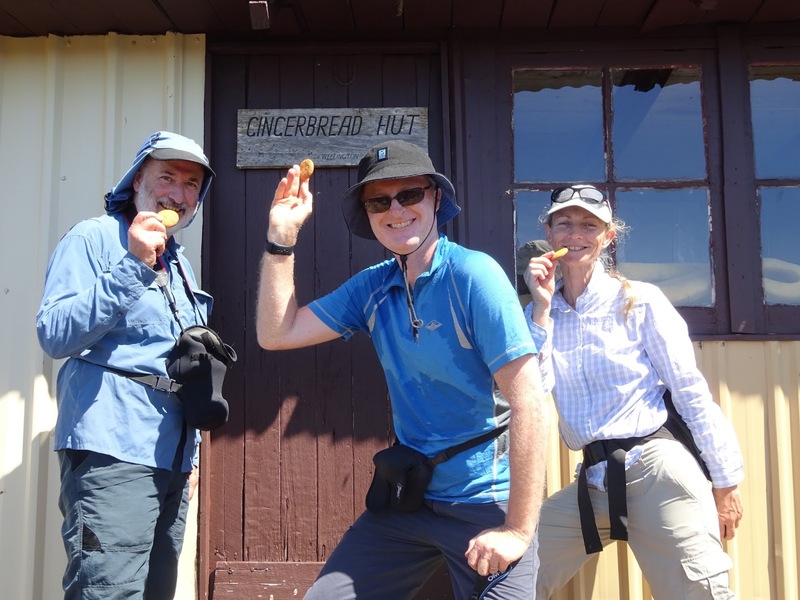 So Jim, Tim, Georgianna and I trundle up the Gingerbread Track and settle in to Joe Slatter Hut. The next day is fine and very warm, and we depart slowly, not keen to hurry into the heat. But we’re already hot and sweaty as we reach Gingerbread Hut, a bit more than half way up Mt Rufus. There Georgianna offers us themed refreshments: some gingernut snaps to scoff while we cool off inside the quaint little hut. Before long – although not without more sweat – we’re on top of Rufus. We’ve come up the route-less-travelled, but meet “traffic” as we join the main track near the summit. And why wouldn’t people have made the effort to climb up here from Cynthia Bay – the usual route – given the extraordinary scenes that the mountain-top affords on a day like this? To the west are Mt Gell and the Cheyne Range, and in the distance beyond that the distinctive dome of Frenchmans Cap. To the north, and closer, the crooked domes of Byron, Cuvier and Gould are the warm-up act for the craggy bulk of the Du Cane Range. 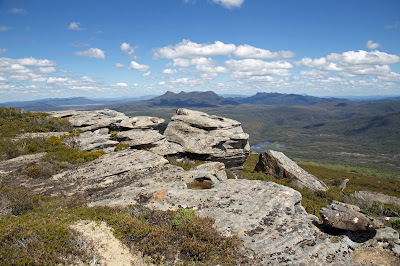 And that in turn resolves into Mt Ossa and the Pelions, the roof of Tasmania. Over lunch we share information and enthusiasm with the other walkers, some from as far away as France, Italy and Spain. They’ve all seen grander mountains at home, for sure, but nothing has prepared them for the palpable sense of wilderness here. From this summit we are not seeing the likes of roads, buildings, towns, powerlines and cable-cars, which seem to be the staple of European high places. The walkers’ faces show their appreciation of the wonder of this place. Meanwhile Tim and his cousin Georgianna are eyeing off our neighbouring mountain, Mt Hugel. It sits on the other side of an ancient cirque that once fed glacial ice down to leeawuleena/Lake St Clair, gouging out Forgotten Lake and Shadow Lake in the process. We’re too late for explorations in the Hugel direction today, but when Tim starts saying things like “How hard could it be?”, we know an idea has lodged firmly in his mind. For now we’re all content descending in a slow, erratic and mainly off-track fashion. Below the Gingerbread Hut we find a well-watered clearing that would make a great camping spot, in fair weather at least. A small, sometimes underground creek meanders through the low bush, finding the occasional pool or mini-tarn to slow its way down the mountain. The day has reached its hottest, and we pause to taste the creek water. If there is any beverage that can beat the pure cold water of a mountain creek, I’ve yet to taste it. From there were fan out to explore the scrub, and to wander slowly downwards. 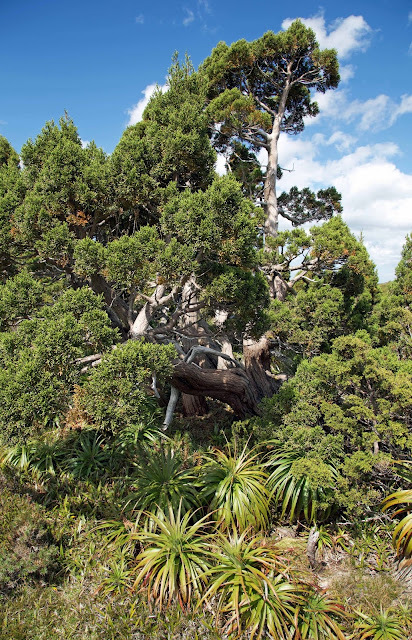 There are patches of scoparia, and a few marshy spots, but we avoid those, and head instead towards a small and lonely-looking stand of pencil pines. I push through the scented foliage into the thick shade of what I assume to be a young stand of trees. But in the centre I find a gnarled old tree, stooped, forked, but thick with growth. It must be several hundred years old. I breathe deeply, take in its good air, and grieve a while for its sibling pines that have gone forever in this summer’s fires. And then we slowly make our way back to the hut, stopping for photographs, water and anything else that takes our fancy. Sometimes it’s good just to amble.